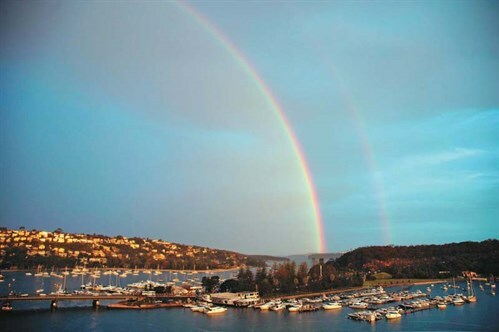 Our comprehensive guide to the best marinas in Australia has everything you need to know. 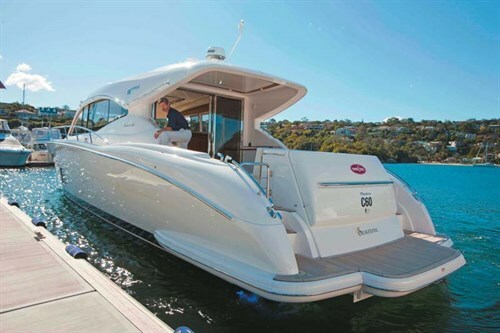 See our complete guide and list of marinas in Australia in all states. The marina is the boater’s second-home, a safe haven when she blows, a chummy place to obtain any amount of free advice, a hub with cold drinks and honest grub, and a place to tie your boat. Indeed, modern marinas are no longer just boating parking lots — they have become destinations in their own right. The best marinas in Australia of them offer everything from laundry services and internet connections to club facilities, fine dining and community events. Problem is, marinas suffer an image problem thanks partly to the tinkering array of luxury boats parked therein. Not everyone can appreciate the marina life, especially when prevented from strolling the gangways with a hot coffee in hand (one of my favourite casual pastimes), or mooring a boat because of exorbitant fees in amenity-strapped waterways. There remains a need for new infrastructure by way of modern marinas that interface with the public and accommodate forecast future boat ownership rates. The multimillion-dollar question is: how can one create a new marina to the satisfaction of everyone from landlubbers and community groups to well-heeled captains and knockabout skippers looking for a home for a modest 30-something-footer? No matter where they are built, the only way public marinas — as opposed to those private marinas attached to housing developments — will be accepted is if they embrace a holistic approach and welcome the public aboard. Remove the barbed-wire gates, lock-up the savage guard dogs, offer accessible ways out on the water. Create a recreational destination with broader community amenities. Taking things further, a marina could be the hub of a maritime precinct that’s home to heritage fleets, traditional skills, flotillas of sailing craft for organised school sport, disabled sailing, amenities blocks, with visiting vessel accommodation. Families from the bush to the beach would have a destination with purpose, a place with meaning, that celebrates the marina lifestyle we champion. As a boater who frequents marinas, I feel I know what counts. It’s that aforesaid interface. Cue nostalgic music. I remember walking with my father along the gangways of d’Albora Marinas at The Spit in Sydney. This was something we did often — ogle the boats. Back then, a Bertram 45 was king, with a few Ocean 50s thrown in. Otherwise it was a 30-something. All of them seemed unattainable dreams. How times change. Look at d’Albora Marina now. Look at the calibre of boats. Our family even owns one! From little things big things grow. Yet there are some things about good marinas that remain constant. First, they need to be on the water, with plenty of water depth at low tide, hopefully well-protected from the weather and preferably with stirring views. You know the saying about moving heaven and earth, well, boaters will try their best to shunt the marina a few metres when they dock. So they need to be built strong, too. The big concrete floating types are our preference. To the detractors, marinas bring traffic, parking and noise issues, and steal the views. They are also seen to be environmental unsound, something the marina industry is actively addressing with its Gold Anchor and Clean Marinas programs. Perhaps of greater concern is the perception that marinas are the preserve of the rich, gated boat-parking lots, with no public access. This is what I’d like marinas to address in the course of creating the user-friendly marina. Engage the wider community. Invite them to lunch on deck, buy a coffee and breakfast to go, grab the daily papers and milk, if not greater provisions. Be a venue with eateries and other hooks. Waterfront dining always wins out. Provide ways on the water. Hook up with a local tourist ferry, water taxi, fishing guides, boat and kayak operators, and so on. Get the public aboard. And welcome visiting boaters. Become the waterfront hub on the waterway by encouraging visitation from a wider boating audience. This brings us to access. 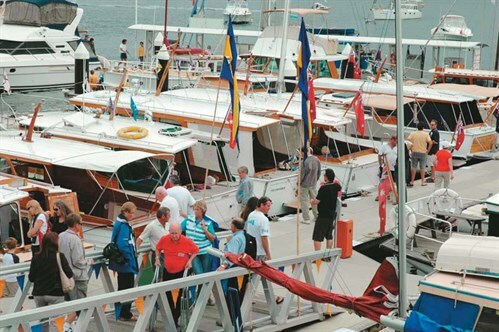 As I recounted at the outset, allowing the public to stroll the gangways can lead to a lifelong interest in boats, dispelling the myth that marinas are preclusive, while providing a thronging business. d’Albora Marinas at Nelson Bay in Port Stephens is an example of a public marina that’s evolved to become the centre of town. In some cases, it should be a condition of consent to their Development Application that there is public access by land and water. Think of the marina as an extension of the foreshore, if not a tourist attraction. Provide boardwalks, retail shops, cater for commercial craft like whale watching and fishing tours, add a seafood co-op for the local trawler fleet. This is pretty much the model at Port Stephens. Visiting boaters want to berth on a whim. So it’s in everyone’s interests to have accessible, well-fendered visitor’s berths. There should be an area on the end of the outer arm or somewhere for casual berthing for diners. And we also want a touch-and-go provision for picking-up and offloading passengers, gear and garbage (don’t underestimate the importance of its disposal). I’ve been chased away by ranting marina operators before. Very ugly. Yet this was the same marina from which I had bought thousands of litres of fuel before. Marina crew should catch or throw lines, tell us what side to fender up, give us a spot on the outside arm until the storm blows over, even offer to move our boats the following day. Take the fear and loathing, the knee-knocking, out of docking, and you have won over 75 per cent of pleasureboaters. Cleats and bollards, non-marking poles around which to pivot, fenders along the berth and wheels on the corners all assist with docking. We like wide berths, too. Marinas are getting tight due to bigger boats and greater demand, which means less surface area to go around. I hope marina operators do their best to maintain decent berth sizes and where possible include more big-boat berths in their development plans. For that’s where waiting lists are greatest. 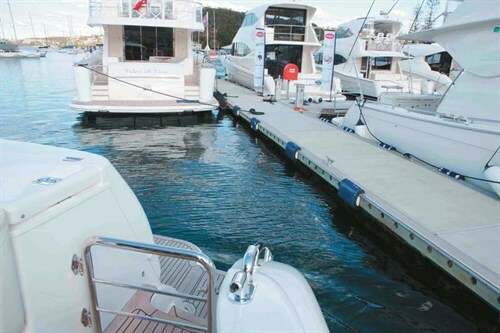 Marinas need to retain cost-effective berthing for the less-than 10m class, whether in water, on the dry, or in a rack and stack. This currently under-serviced market has huge potential to grow. Downsizing baby boomers meet with upsizing trailerboaters. A $200,000 boat has appeal, as our leisure time diminishes and dayboating/weekending makes more dollars and sense. Imagine this. A marina where the newspapers are delivered on deck in the morning. A marina where the manager walks around with cool towels in summer. A marina where complimentary cocktails are served at sunset. A marina where you can buy a $15 roast of the day and walk away sated. I’ve been to marinas with all this and more. The personalised service is what boat owners remember most. Jim at Soldiers Point Marina, in Port Stephens, would call my partner Katherine on a Friday afternoon and ask: "Are you coming up? Would you like the loan car? Anything else I can do?" It was music to the ears of an inner-city lawyer. So we’d head up more often than not and pay custom to the marina restaurant, kiosk, fuel bowser and more. 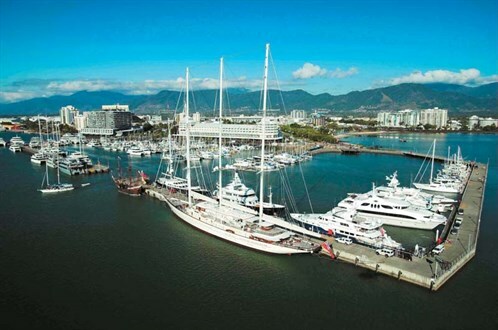 Good marinas adopt a hotel-like attitude, meet and greet, provide ‘room’ or in-berth service. Remember, happy kids make happy parents, so the best family amenities have a kid’s club, movie room, rental DVDs. Provide a heated pool like Royal Motor Yacht Club Broken Bay and you’ll have them eating out of your hand or the adjoining bistro. Then comes Wi-Fi, cable or sat TV. Good marinas keep abreast of technology and provide it. Boats need maintenance so marinas should offer support networks and services, preferred partners and trades. 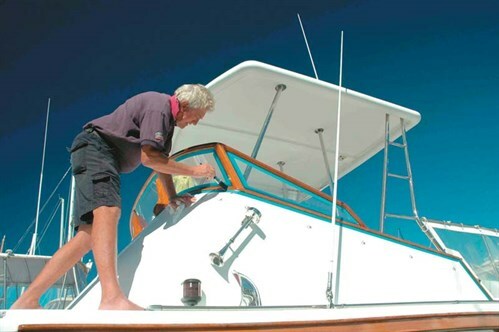 Having preferred mechanics, shipwrights, detailing and brokers on hand helps boaters get out of a bind and perhaps trade on up to a bigger boat and berth one day. I like a marina that looks after our boat as though it were its own. We docked the other day, wife holding child in one hand, garbage bag in other. Before she could step off, a hand reached out, grabs the garbage and tosses it in the bin. Baby safe, too. The best marinas are like that: on hand to help. All any boater needs is an excuse. Events are the go. Create public events and the marina will be heaving. The annual Timber Boat Show at my club’s marina sees a bunch of chummy folk get together with the wider audience. Fishing tournaments and competitions, kids/family events, sailing in twilights, mid-week and weekend regattas all hold appeal, while keeping the bars and cafés ticking over. Create a Cruising Division and help the marina occupants discover new destinations on the back of other more experienced folk. Then offer reciprocal rights to a concurrent cruising club. The shopping berths at Birkenhead Point in Sydney offer a self-staged event. But any marina with visitor’s berths is handy for tapping into local entertainment events. Boat parking in downtown Darling Harbour can be cheaper than driving in and heading underground. Take in a movie or show then retire aboard. When was the last time you had a good chat over the back fence with your neighbour? It’s increasingly uncommon in today’s gated word. But marinas have no fences between boats and staff. User-friendly marinas attract friendly people and foster a sense of community. Indeed, a good marina is a community asset. To this end, they sometimes host open days, tuition, courses, markets, produce stalls, themed events and encourage new marina custom. The sense of community can be so strong that boaters won’t want to leave the marina. This has given rise to the marina residential complex that sure beats a retirement village on a golf course. The only handicap is when the on-sell market slows down, but residential is choppy everywhere in any case. Security is a double-edged sword. On one hand we boaters want our beloved Blue Bayou to be safe. On the other, good marinas engage the public. So the level of security is dependent on your location. But as marine theft is on the rise, the top marinas lock the gates and engage security patrols after dark. Another thing we like is the boat-cam so you can monitor your boat remotely from your mid-week desk via a log-in marina page. Put all this together and what you have is more than a boat-parking lot. What you have is a destination, a home-away-from-home that will be high on the list of boaters and would-be boaters. 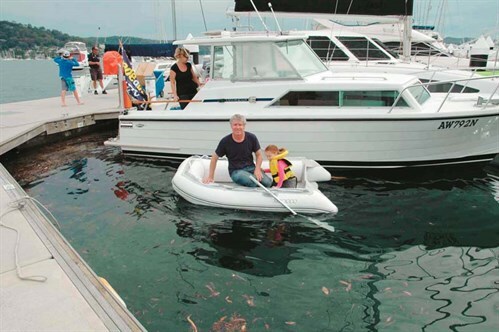 The user-friendly marina is something everyone covets in fair and foul weather. Matter of fact, I’m heading there now. David Lockwood was among the speakers at the Marinas 2011 biennial conference. The above is an edited version of his speech about what makes a great marina. Originally published in Trade-A-Boat #421, December 2011. Why not subscribe today?